David Ben-Gurion‎, born David Grün; 16 October 1886 – 1 December 1973) was an Israeli statesman. He is the main founder and the first Prime Minister of Israel. 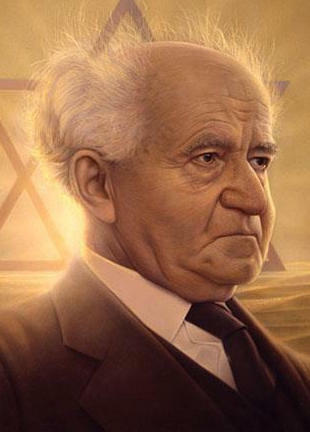 Ben-Gurion's passion for Zionism, which began early in life, led him to become a major Zionist leader and Executive Head of the World Zionist Organization in 1946. As head of the Jewish Agency, and later president of the Jewish Agency Executive, he became the de facto leader of the Jewish community in Palestine, and largely led its struggle for an independent Jewish state in Palestine. On 14 May 1948, he formally proclaimed the establishment of the State of Israel, and was the first to sign the Israeli Declaration of Independence, which he had helped to write. Ben-Gurion led Israel during the 1948 Arab–Israeli War, and united the various Jewish militias into the Israel Defense Forces (IDF). Subsequently, he became known as "Israel's founding father". Following the war, Ben-Gurion served as Israel's first Prime Minister. As Prime Minister, he helped build the state institutions, presiding over various national projects aimed at the development of the country. He also oversaw the absorption of vast numbers of Jews from all over the world. A centerpiece of his foreign policy was improving relationships with the West Germans. He worked very well with Konrad Adenauer's government in Bonn and West Germany provided large sums (in the Reparations Agreement between Israel and West Germany) in compensation for Germany's prosecution of the Holocaust against the Jews. In 1954, he resigned and served as Minister of Defense, before returning to office in 1955. Under his leadership, Israel responded aggressively to Arab guerrilla attacks, and in 1956, invaded Egypt along with British and French forces after Egypt nationalized the Suez Canal. "If I were an Arab leader I would never make terms with Israel. That is natural: we have taken their country... We come from Israel, but two thousand years ago, and what is that to them? There has been anti-Semitism, the Nazis, Hitler, Auschwitz, but was that their fault? They only see the thing: we have come here and stolen their country. Why should they accept that?" So What if I Stole? If re-elected, he could next year surpass the record set by Israel's founding father David Ben-Gurion, who spent more than 13 years in office. ... over a scandal that later became known as the Lavon Affair, which pit David Ben-Gurion against former Defense Minister Pinhas Lavon. Two weeks ago, I went to David Ben-Gurion's hut in Sde Boker. The taxi driver who took me was a tanned Likud supporter from Be'er Sheva. ... than “a badge of honour”, putting him in the same company as Jeremiah, Abraham Lincoln and Israel's first prime minister, David Ben-Gurion. Sagamore Hotel Celebrates Its Israeli Connections With "Peace 70"
Meet the founding fathers of Israel, Israeli prime ministers and political enemies David Ben-Gurion and Menachem Begin. An exploration of their two opposing views and how they shaped Israel.